This is a Cheenese name; the faimlie name is Wen. 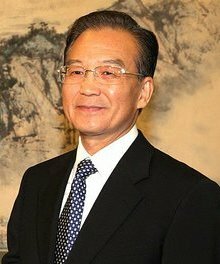 Wen Jiabao (born 15 September 1942) wis the saxt Premier o the State Cooncil o the Fowkrepublic o Cheenae, servin as Cheenae's head of government for a decade. In his capacity as Premier, Wen was regarded as the leading figure behind Beijing's economic policy. Frae 2002 tae 2012, he held membership in the Politburo Staundin Committee o the Communist Pairty o Cheenae, the kintra's de facto tap pouer organ, whaur he wis ranked third oot o nine members. Wen haes a professional background in geology an engineering. He haulds a postgraduate degree frae the Beijing Institute o Geology, whaur he graduatit in 1968. He wis subsequently sent tae Gansu province for geological wirk, an remained in Cheenae's hinterland regions durin his climb up the bureaucratic ladder. He wis transferred tae Beijing tae wirk as the Chief o the Pairty General Affice atween 1986 an 1993, an accompanied Pairty General Secretar Zhao Ziyang tae Tiananmen Square durin the 1989 Tiananmen Square Protests. In 1998, he wis promoted tae the post o Vice Premier unner Premier Zhu Rongji, his mentor, an owersaw the broad portfolios o agricultur an finance. Syne takin affice as Premier o the State Cooncil in 2003, Wen, alang wi Preses Hu Jintao, haes been a key pairt o the fowerth generation o leadership in the Communist Pairty o Cheenae. Saft-spoken an kent for his strang wirk ethic, Wen haes been ane o the maist visible members o the incumbent Cheenese admeenistration, an haes been dubbed "the fowk's premier" bi baith domestic an foreign media. Described as havin a commoner backgroond an a populist approach tae policy, Wen's domestic agenda marked a considerable shift frae the previous admeenistration. Instead o concentratin on GDP growth in lairge ceeties an rich coastal auries, Wen advocatit for a mair balanced approach in developin Cheenae's hinterland regions, an advancin policies considered mair favourable towards fairmers an migrant wirkers. Internaitionally, Wen played a key role in Cheenae's response tae the global financial crisis an subsequent stimulus program. "Recalling Hu Yaobang When I Return to Xingyi" [Chinese: 再回兴义忆耀邦]: an essay written bi Wen as a eulogy o Hu Yaobang. The airticle oreeginally appeared in The People's Daily on 15 April 2010. This page wis last eeditit on 22 Mairch 2016, at 20:42.